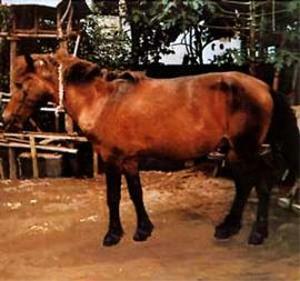 The Bali Pony is an ancient breed now living on the Indonesian island of Bali. Its roots are unknown, although one theory is that ponies of ancient stock were brought to Indonesia by the Chinese in the 6th century. If this theory is true, the Bali pony would owe much of its roots to the Mongolian Horse. In addition to the Mongolian horse, it is known that some Indian stock were taken to Indonesia (although it is unknown exactly which breeds), and the Dutch also brought various eastern breeds to the country during the 18th century. Therefore, the Bali pony likely has been influenced by both the Mongolian horse, and various other eastern breeds. The Bali Ponies are quite hardy and self-sufficient, surviving with little outside care. They are tough animals that are not shod and are remarkably sound, with hard feet, and strong legs. The ponies show the usual "primitive markings" such as a dorsal stripe, shoulder bars, and zebra stripes on the legs, in addition to their dun coat, that includes a black mane, tail, and legs. The ponies lack the traditionally "pretty" conformation, having a large and unrefined head, and upright shoulder that produces short and choppy strides. The chest and back are narrow, although the neck is usually of a good length. The ponies usually range from 12-13 hands. Both the conformation and the coloration produce a pony that looks similar to the Przewalski's Horse. The Bali Pony is used by the indigenous population for hauling coral and stones from the beach. They are also used for trekking and sightseeing tourists. The are strong and have excellent endurance. There are eight breeds native to Indonesia, the others are the Batak Pony, Gayoe, Deli pony, Java Pony, Sumba and Sumbawa Pony (and closely related Sandalwood Pony) and Timor Pony.